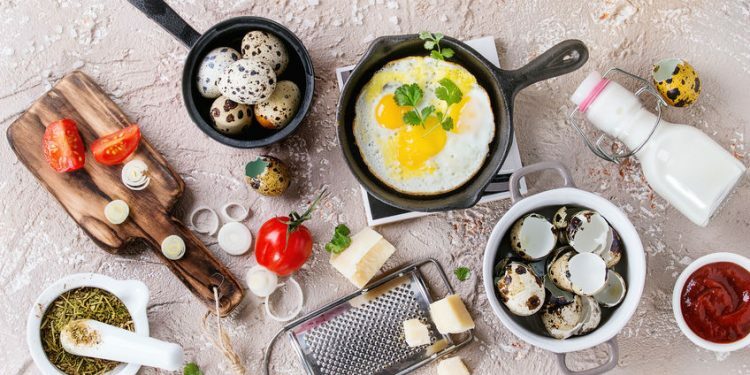 So, you’ve decided to switch from a Teflon coated pan to one with a PTFE and PFOA free coating. 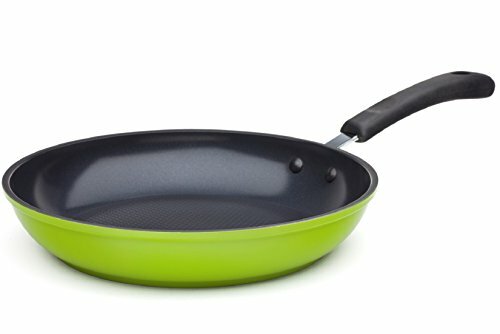 One option is the Green Earth Frying Pan by Ozeri, with Textured Ceramic Non-Stick Coating (100% PTFE, PFOA and APEO Free). Our review of this pan and also applies to the 8 and 12 inch pans in this product line. I was skeptical of Ozeri's claims about this pan and wanted to see for myself. I was surprised at how well this frying pan performed. Additionally, it is sturdy and is very easy to lift and maneuver. I fried an egg with no oil/fat. The egg slid out of the pan easily and did not stick to the surface. The User’s Guide suggests that prior to heating, rub 1 tsp of oil (for the 12’ pan) evenly into the surface of the pan with a paper towel and then remove the excess oil. Peanut or coconut oil can be used, while cooking spray is not recommended. Only ¼ tsp oil is need for the 8” pan and ½ tsp oil for the 10” pan. I scrambled two eggs and the results were the same as the fried egg. I used a wooden spoon to move the eggs around the pan and the eggs slid out of the pan nicely and appeared to be evenly cooked. Cannot be used for high temperature searing. Durable: The Green Earth Frying Pan is made with heavy gauge pure aluminum which allows for even heat distribution and retention. 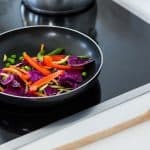 Nonstick surface: The Greblon® coating system (primer and topcoat) used in this pan is formulated by a German Company, Weilburger Coatings GmbH. It is free of PTFE (link to ptfe explanation) PFOA, APEO, lead and cadmium. The ceramic coating for this Green Earth Fry Pan is made in Germany and shipped to China for final assembly. 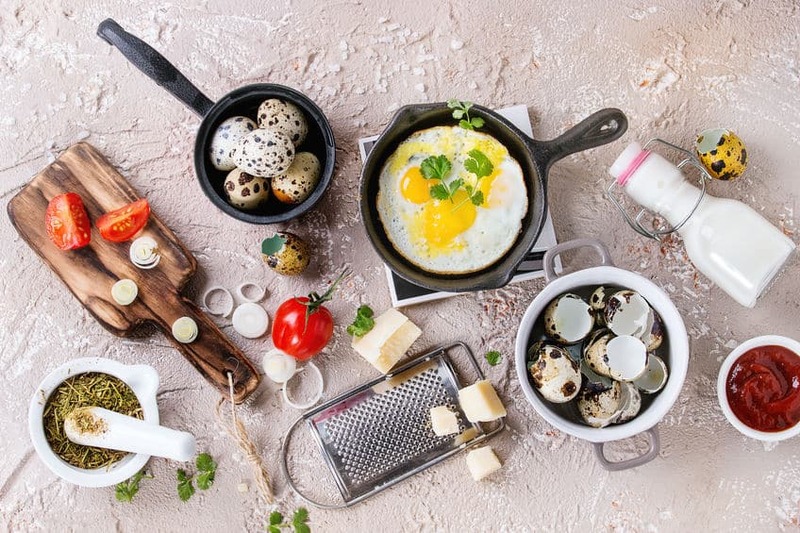 The nonstick design of the pan requires only a small amount of oil/fat. 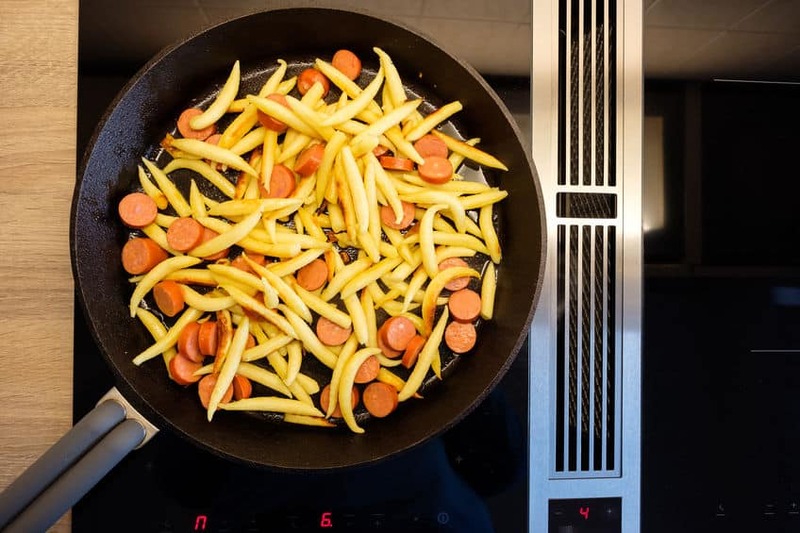 Versatile: This nonstick fry pan can be used on induction and conventional stovetops. A layer of magnetized stainless steel on the base makes the pan induction friendly. Great design: The sloped sides give the pan more cooking space, so you don’t need to overcrowd the pan. The cooking surface has an elevated, textured honeycomb pattern which helps prevent food from sticking to the surface. The air pockets formed by the honeycomb (the hexagons on the pan are slightly elevated) allow for better heat distribution. This pan is sturdy and just the right weight. Handle: The silicone coated handle is thick, easy to grip and stays cool to the touch. 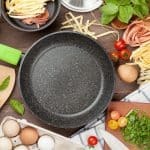 Some reviewers have commented the Green Earth Frying Pan doesn't retain its nonstick property for very long while others have not experienced this. The User’s Guide states this pan is oven safe to 180°C/356°F. 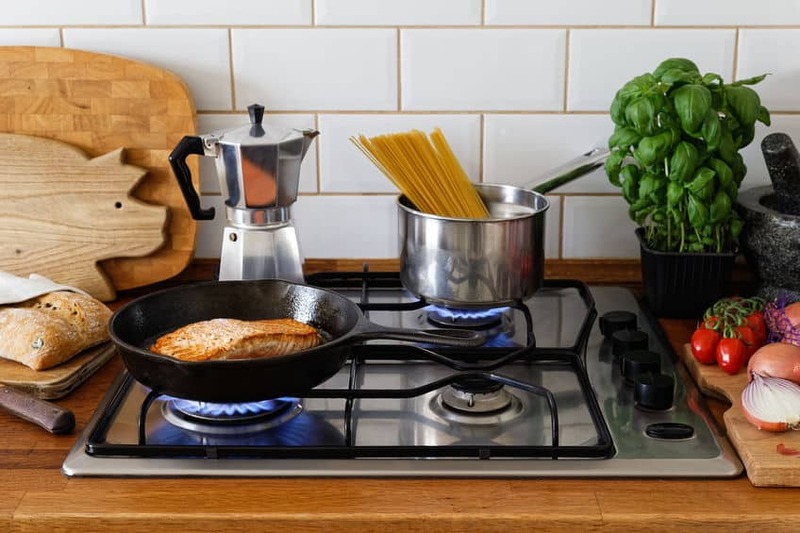 Match the pan size to the burner size. Don’t use on high heat as the coating might crack. Scrub with non-stick safe nylon sponge/scrubber (never abrasive materials such as steel wool). Don’t use metal or sharp objects to stir or flip the food since it might damage the coating. Use wood, bamboo, silicone or nylon utensils. Allow the pan cool to room temperature before washing it. Hand washing is recommended as the high heat and harsh detergents break down the nonstick coating. Use the included pan separator or a cloth or paper towel when stacking to prevent scratching. Replace pans when the coating begins to peel or is chipped. 1) Cover the bottom of the pan with water and sprinkle baking soda over the water to make a paste. 2) Let the pan sit for a few hours and then rinse and wash the pan. 3) If stains are still present then boil 4 tablespoons and one-half cup of water in the pan. Let the pan cool. Then rinse and wash the pan. If the stain is still there, then scrub it with baking soda and a nylon scrubber. One method is to place a mixture of three parts water to one part vinegar in the pan and heat it on medium for five minutes or even ten if necessary. Another technique is to boil ½ cup of vinegar in the pan and let it simmer for a few minutes. Once the liquid has cooled, wash the pan with warm, soapy water using a nylon scrubber. 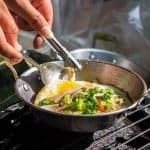 The Green Earth Frying Pan is a reasonably priced option for those looking for a PTFE and PFOA free nonstick frying pan. The overall construction of the pan is solid as the substrate is heavy gauge aluminum. 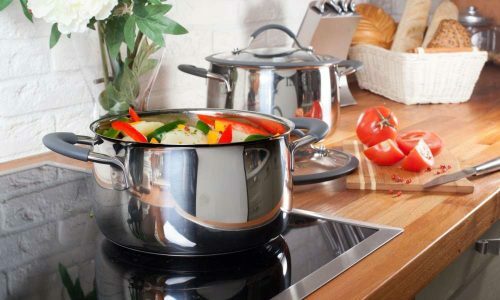 If you decide to buy an induction cooktop, this pan can be used with it as well as on all conventional stoves. Even though this pan is only oven-safe up to 386ºF, this should be more than enough for most cooking applications. One area of concern noted by some purchasers of this pan is that the nonstick coating does not last very long.